For some people hunger is an empty feeling in the abdomen, an emptiness that demands to be filled. Others experience constriction, as if the stomach is trying to grind up food that isn’t there. Not many people describe these sensations as pleasant. From the evolutionary point of view, it’s good that we perceive “hunger pangs” as unpleasant. If we didn’t, we might starve to death.Often hunger is described as gnawing, as if an animal were eating at our insides.Confusion can occur with anxiety, which often makes our stomach growl or grind. If we mistake anxiety for stomach hunger, we may eat, trying to make the growling or gnawing go away. Unfortunately, eating doesn’t work. In fact it can start another vicious cycle. It is important to be aware of the sensations in the stomach during the day. How does the stomach signal to us that is hungry. When we are eating we should focus what sensations tell us that our stomach is empty, pleasantly full or overfull. Stomach hunger can be satisfy by the right amount and kind of food. When we open our awareness to investigate when the stomach is most at ease, what do we find? Stomach like to do its work. It doesn’t like the feeling of being very full. It can’t work well when is overfilled. Although our mouth might enjoy being full most of the time, stomach disagrees. It likes to be comfortably full, about two-thirds full. It also likes to be empty to rest. After we have eaten half of our food it is advised to stop eating and take few seconds to assess hunger again. 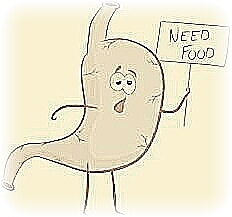 To satisfy stomach hunger we need to feed the stomach just enough food, let it do its work, and then let it rest.